Not many people may know that when former President Barack Obama was visiting Detroit in 2016 for the North American International Auto Show, he stopped at Jolly Pumpkin Brewery for lunch. He wanted “a regular old cheddar cheese burger” with lettuce, tomato, and mustard – and of course when the president asks for something, that’s what he gets. 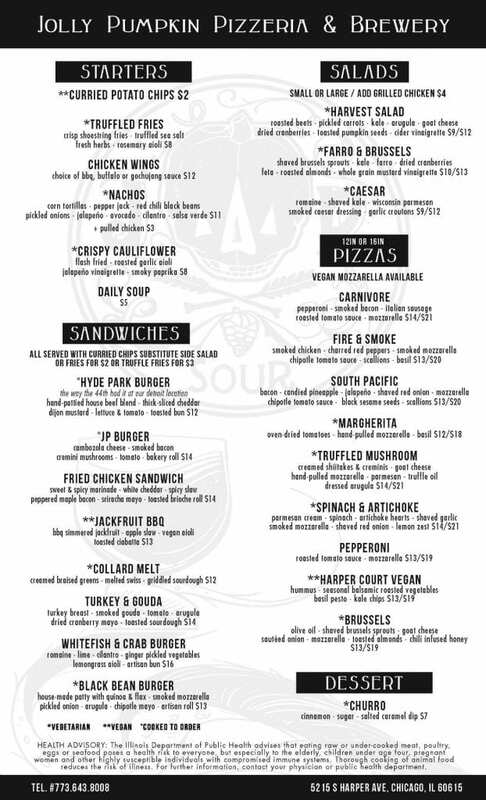 Obama’s special cheeseburger order has now been immortalized as the “Hyde Park Burger,” one of the items on the refreshed Jolly Pumpkin Pizzeria & Brewery menu at their Harper Court location in Hyde Park. For those who want a more dressed up burger, the JP Burger on the menu features Cambozola cheese, smoked bacon, cremini mushrooms, and tomato. The updated menu is available starting Wednesday, January 23, and includes two new starters, three new sandwiches, one new salad, three new pizzas, and dessert – with added options for vegetarians and vegans. For those on gluten-free diets, Jolly Pumpkin offers a gluten-free crust option for all pizzas, as well as gluten-free buns for the sandwiches. New starters include the Crispy Cauliflower with a roasted garlic aioli and a daily soup – and diners can now order their chicken wings with a choice of three sauces – barbecue, buffalo, or gochujang sauce. Additional sandwich options include the Hyde Park Burger, Jackfruit BBQ, and Collard Melt. A Harvest Salad with roasted beets, pickled carrots, kale, arugula, and goat cheese is now available, and new pizza choices include spinach & artichoke, Harper Court Vegan, and brussels sprouts. And the churro dessert with cinnamon, sugar, and a salted caramel dip is the perfect way to end a meal. Along with the new menu options, Jolly Pumpkin Pizzeria & Brewery now offers full service dining, with wait staff taking all customer orders. Jolly Pumpkin Pizzeria & Brewery has 30 beers on tap, as well as craft cocktails made from the company’s own vodka, rum, gin, bourbon, whiskey, and house infused liquors. Visit the Hyde Park location of Jolly Pumpkin at 5215 S. Harper Court, open from 11 a.m. to 11 p.m. Monday through Thursday, 11 a.m. to 1 a.m. Friday and Saturday, and 11 a.m. to 10 p.m. on Sunday.